Can Septic Systems Be “Green”? The “Go Green” movement is modern and popular, but septic systems have been “green” from the very beginning. 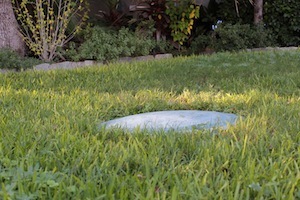 A standard or conventional septic system with an absorptive drainfield usually has two main components: the septic tank and the absorption area. The tank separates the solids from the liquids, then the liquids flow out to the absorption area and percolate into the soil. The septic system uses natural bacteria to treat the wastewater, which is then “recycled” into our groundwater supply as it moves through the soil. The only time a septic system isn’t “green” is when it’s malfunctioning or being improperly used. Proper usage and maintenance not only ensures that the system functions properly, but also that the soil and groundwater supply are not contaminated. Here’s three more ways to keep your septic system environmentally friendly. We’ve been installing and maintaining septic systems for almost 80 years, and can help you keep your septic system working properly. Give us a call at 830.249.4000 (Boerne) or 210.698.2000 (San Antonio) to schedule a pumping!